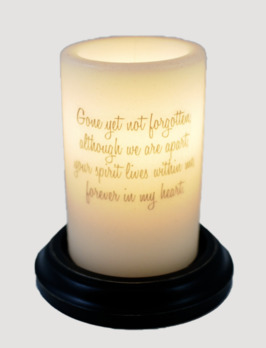 The Mr. & Mrs. Candle Sleeve makes a great gift for a Wedding or newly married couple! It's a unique gift they will appreciate for years to come! 6 watt bulb and the base of your choice (Antique White, Chocolate & Black) sold separately on our site. The This Is Us Candle Sleeve makes a great gift for a Wedding or couple celebrating an anniversary! A great gift that lasts for years! l6 watt bulb and the base of your choice (Antique White, Chocolate & Black) are all sold separately on our site. 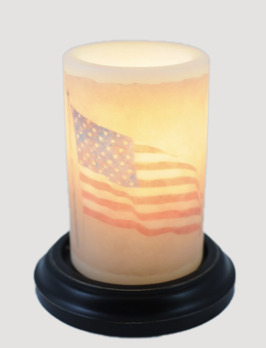 The Waving American Flag Candle Sleeve celebrates our great flag and country! 6 watt bulb and the base of your choice (Antique White, Chocolate & Black) are all sold separately on our site. 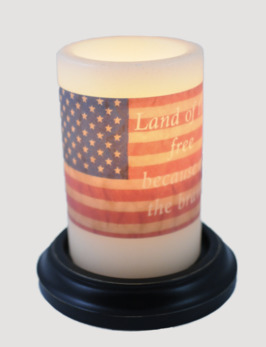 The Flag Land Of The Free Candle Sleeve celebrates our great flag and the veterans who have sacrificed so much for it! 6 watt bulb and the base of your choice (Antique White, Chocolate & Black) are all sold separately on our site.